The news is more broken than ever before. It’s difficult to believe what you read from news sites, and you know you can’t trust social media. The onus is now on the reader to find the right places to read the most factual articles. For most of us, Google News remains one of the main ways we find out what is happening. But even with the new changes in Google News, it raises many of the old issues. Over the years, publications have gotten only better at gaming Google’s algorithms, and it’s only a matter of time before they trick the new Google News. What you need are new ways to find out what is happening in the world around you. The internet’s largest community has a new trick up its sleeve. On the official Reddit iOS app, you will now find a new tab at the top next to Home and Popular. Reddit now serves you the News. The cool part about the News tab is that it breaks you out of your filter bubble. It won’t only show you the news from subreddits you are interested in, it will showcase the most important article links, shared across different subreddits. Sure, you can still add topics you are interested in, like sports or science, but the basic “All Stories” tab will help much more. Due to how Reddit’s upvoting system works, Reddit News also benefits by showing you the most upvoted article about any event. And instead of that article’s comments thread, you can come back to engage with the Reddit audience after you’re done reading. Just because an event takes place, that doesn’t necessarily mean it is news. If what you want is impactful news, then an app like Inside is much better for you than reading Google News. 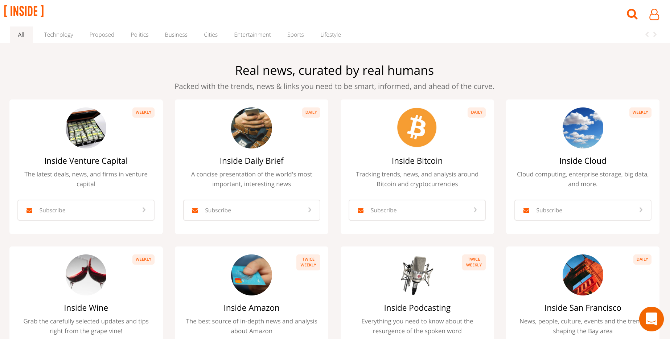 Instead of relying on algorithms like Google, Inside has a team of human experts that curate the news from a wide variety of sources. Each topic (like the Daily Brief, bitcoin, Donald Trump, streaming media, wine, etc.) has a different expert. That expert’s curation turns into an email newsletter, which is sent daily, weekly, or twice weekly, depending on how regularly there is impactful news on that topic. If you want to see how they look before subscribing, you can sample the recent issues. I’d recommend Inside for the Daily Brief and the ReadThisThing newsletters wholeheartedly. It’s also great for a lot of other topics, depending on your interests. But if you’re mainly interested in following technology news, you might want to check out some of the other excellent curated tech news digests. A while back, Elon Musk asked for a new system that ranks news organizations by their trustworthiness. While that will take some time, for now, we have YetiGoGo to fill the void. YetiGoGo indexes the 100 most popular News sites in the USA. Enter a search term and it will show you a chronological list of all the top news around that keyword. 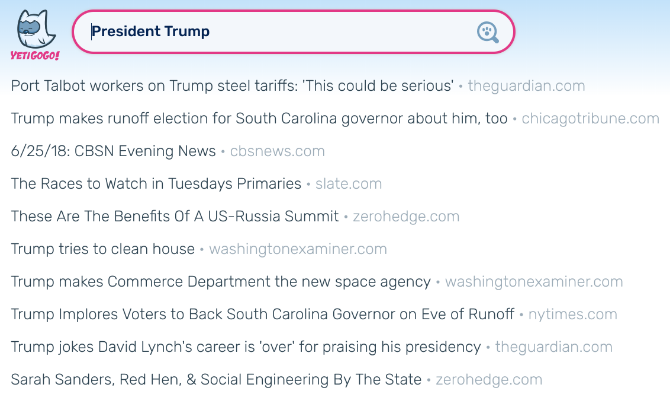 So if you want to see what President Trump is doing today, just search for him. The site stands out for its simplicity since all you get is a big list of headlines. You already know that it’s from a popular and respected news outlet. YetiGoGo also doesn’t mess with the headlines or club them together for a single topic, like Google News does. When you want to read about any issue, forget about searching for it on Google News. Use YetiGoGo instead. News For Mom is everything that is charming and amazing about the Internet. Chris Barr and his mom don’t entirely agree on everything, but they share a common pursuit of intelligence and respectful sharing of ideas. So Chris decided to make a weekly newsletter for his mom to share the different news topics he comes across. And now you can subscribe to that newsletter. Here’s Chris on what News For Mom is all about: “I created this newsletter to open up new paths of conversations with my mom about issues that have an impact on our lives. In each letter, I try to share articles that fall below the fold on issues that are relevant to her: health, education, arts and local/rural/Appalachian issues. I try to avoid argument-inducing national politics and season the email with a bit of humor, a few personal updates and things that capture my imagination.” Here is a sample of one of the recent issues. 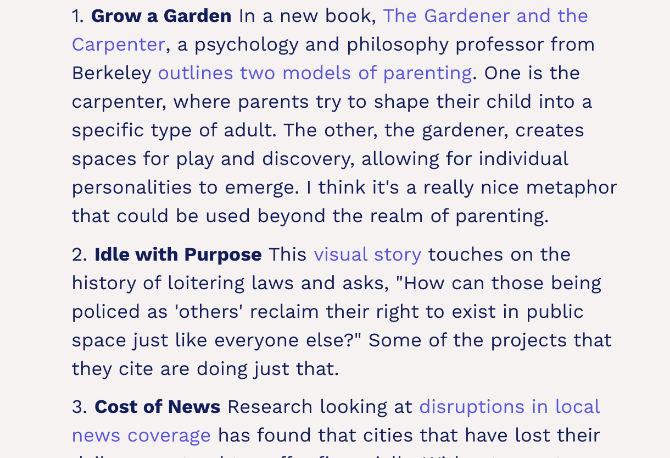 If you’re in the US, News For Mom is one of the coolest ways to read hand-curated news about things that don’t get widely shared on social media or talked about at prime time news shows. Microsoft has long sought to provide alternatives to Google, and Microsoft News is the latest salvo. It’s a repackaged version of MSN News, which has been around for decades now. But what Microsoft does differently from Google is that apart from AI and algorithms, it also uses a team of human editors who curate the news. You could argue that Google’s AI-only approach is the better way to go since it reduces human bias. However, such AI-only approaches to news are seen as some of the problems with getting news from Facebook. If you prefer to balance AI and human interaction, Microsoft News might be the way to go. The app itself is simple to use. Add topics you’re interested in, and it will serve the news about any major happenings around it. You can play videos in the app, read articles, choose a light or dark theme, and even get alerts. It’s not the features that set it apart from Google News, it’s the technology behind how it curates news. With the news overload that we face in the world today, you can miss some of the important things you should know about. You obviously don’t want that to happen, which is why we have the above list of apps to stay up-to-date, and this other list of smart apps to simplify the news.